The Weather, he cometh. 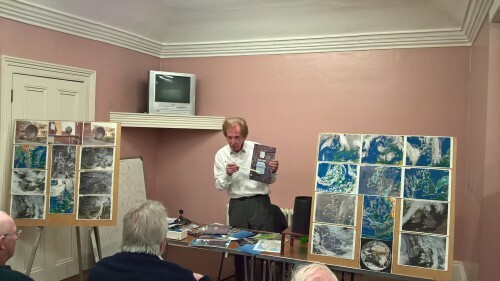 Alan Paul – G3RJI talks weather and weather stations. – Havering & District Amateur Radio Club. Weather, some love the word, some loath it, the truth is we have to suffer it….whatever the weather…..get it..? Having a clear prediction on the weather can be god send, if your nipping to the shops or taking a holiday, the weather is of paramount importance. It gives us fine food and crops, its replenishes the grass and washes away dirt, it brings the rain we need to live, so why are so many so clueless about “weather”. Our very own Alan Paul G3RJI or www.upminsterweather.co.uk fame gives us an amazing in depth analysis of weather and his world renowned weather station. During the talk we had great pleasure in learning why heat is often cooling…..”what”, yes heat can cool us if managed correctly. Call me a hypocrite but its all true and how we manage humidity is key to just that effect. Alans talk spoke in depth on receiving weather data in the early days of NOAA and 136mhz geo-orbiting satellites to geo-stationary satellites of today. Alan now points his equipment to Eutelsat 10a and with snazzy programs to decode weather data from MSG or Meteo Sat 2nd Generation the ordinary amateur weather guy or gal can now be a professional in his or her own right, giving rise to a new breed of reliable weather forecast. Alan has featured in many publications and has been prominent in the Romford Recorder for quite a while. Even using his weather station to send detailed weather via his APRS setup for the rest of Essex and beyond to appreciate. Unfortunately predicting the weather and rendering images from space is costly. I personally tried to get into lightening reporting and using TTA or time to arrival synced to a GPS receiver that received the pulse from a strike and converted the energy from a ferrite type antenna into highly accurate strike data. Something that I did not ever get around to actually doing….baaahh! This is where dedicated weather predictors like Alan Paul step in and take up the rains (not a typo…a pun). Yes Alan has equipment to actually detect and report strikes…..genius (he says in an Italian accent). My turnstile antenna still sits on the side of the house, not really receiving much these days unfortunately, however its testament to a fad I once had with the weather. Now days most of the weather is received directly over the internet or grabbed off websites. A shame really however time waits for no person. I still tune in to Northwoods weather broadcasts on 4610khz from time to time and run FLDigi on my Ubuntu PC just for fun, however I rarely get a chance due to work commitments. Looking at the images we managed to take at the talk we can see boards of stills of Infra-red and Colour images received via satellite to via the Internet. Now days people use one wire techniques and Raspberry Pi’s or Arduino to grab weather data and send it over the Internet for analysis, however just having a DHT22 or worse a DHT11 sensor can lead to big swings in accurate weather reporting and unless your equipment is kept calibrated its unfortunately a hindrance to other dedicated weather predictors. You will see APRS is awash with bad data and corrupt information. So if your thinking about getting into weather on the cheap, keep your information in house as there seems to be a glut of dodgy info flashing around. If you want to get into APRS on the cheap for receiving weather data then you can download AFSK1200 for Windows and use your soundcard to receive APRS on 144.800mhz FM (along with other data of course). As your not transmitting you won’t need a 1:1 transformer to isolate the RF from your PC but remember to remove the cable from your PC to Radio when transmitting. Lastly, Alan took us through his various features that he uses to get accurate weather information, including a Solar sensor, UV sensor and rain gauge. naturally every station needs a thermometer and Alan goes the extra mile with relative humidity sensing equipment, called a Whirling Pschycrometer which is one of the most reliable instruments, not requiring any batteries, and only taking around 15-20 seconds to obtain a reading. It is like a football rattle and is simply a holder with two thermometers, one of which has its bulb end exposed to the air and the other end covered with gauze which is kept wet via a small inbuilt container topped up with water prior to use. The unit is spun around for 15 – 20 seconds and the two thermometer readings are taken. Both thermometers will read differently with the wet one reading lower by just a few degrees. The wet thermometer gives a lower reading because when it is spun around some of the water on the gauze evaporates which cools the thermometer down. Just how much water evaporates depends on the RH at the time. If the RH is high then less water will evaporate and if it is low, then more will evaporate. 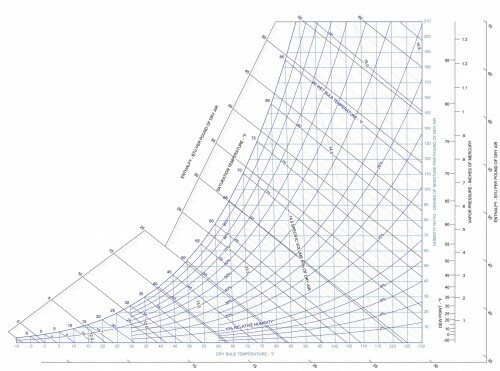 Its a tad confusing but seeing it demonstrated helps and this is all plotted in a large book containing graphs called a Pschycrometric chart book. In the current world or climate change, and weather diversity, then we all should be concerned about the weather….right. Then we should thank our lucky stars we have dedicated weather predicting gurus like Alan Paul G3RJI to keep an eye on what’s hot and not….Oh! no not more puns. More information and live weather data can be found here on Alan’s website. Final word. During the demonstration, Alan’s rain catcher was damaged and we never like to see our guest speakers go away upset. As this equipment came from the USA it naturally cost quite a bit. If you have a rain gauge or catcher that you would like to sell or donate then please contact the website here g4hrc@haveringradioclub.co.uk. In the meantime I will search the web for a replacement. Remember Alan puts weather data into the public domain for free, his services are free so in between running a full time business he also gives up his valuable time to give us delightful weather data. The Davis Rain Collector.